“Bless the Bees” is not a book just about bees. It is a book about us – the human race. It’s about why bees and other pollinators, such as bats, birds and butterflies are so important to us and what we have done to the environment which has caused their numbers to dwindle. Since 2006, their entire adult hives have perished from a mysterious disorder named “colony collapse disorder”. “Bless the Bees” tells you what causes contribute to it, which also contribute to the endangerment and extinction of other pollinators and what you can do to help so this does not happen. 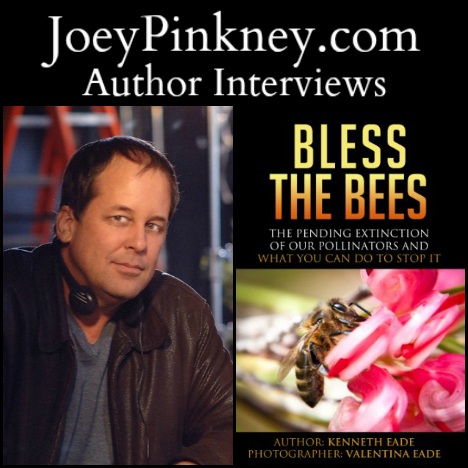 Joey Pinkney: Where did you get the inspiration to write “Bless the Bees”? Kenneth Eade: A year ago, my wife, Valentina Eade, and I were celebrating our second wedding anniversary in San Francisco, California. At brunch, on the table, was an informative brochure, telling us about the bee epidemic and that the hotel was keeping hives on their rooftop to help ameliorate the situation. I had thought that the bee crisis had long passed, and we were both very alarmed over it. She is a professional photographer. I am a writer. So, we both decided to “shake things up” and generate awareness about what is probably the most important environmental and human issue of our lifetime. Valentina Eade has been all over the world working on her project, and the photographs in this book are of just some of the “friends” we have meet along the way. We hope you enjoy them and the book and that it makes you feel as strongly about the subject as we do. JP: What sets “Bless the Bees” apart from other books in the same genre? KE: There are several books on “colony collapse disorder” and how it affects honey bees. Nobody knows the cause of it. “Bless the Bees” is the first book which postulates, with scientific studies, that the suspected causes are all contributing causes. These same things, like pesticides and habitat destruction, are contributing to the deaths of other important pollinators, like bumblebees and bats. JP: As an author, what are the keys to your success that led to “Bless the Bees” getting out to the public? KE: Of course, Amazon has made it easier for authors to connect with publishers and the public. But the message in “Bless the Bees” is important for everyone to read. This situation impacts on life as we know it on this planet. The main key to success will be people telling other people what is happening to our world. Working together, we can correct this terrible oncoming disaster. JP: As an author, what is your writing process? How long did it take you to start and finish “Bless the Bees”? KE: My writing process is to just sit down and write, and it comes. “Bless the Bees” started out as two articles that I wrote for a local law journal. That inspired me to start BeeBay.org, a non-profit organization to address the issue. As a result of doing research and posting news on the web sites for Bee Bay, I decided to put all the information in one easy source, to educate people and tell them how they can each help in their own way. JP: What’s next for Kenneth G. Eade? KE: I have written three other books – one a children’s picture book on the same subject. I will continue as an environmentalist and activist, and I will continue to write both fiction and non-fiction books.